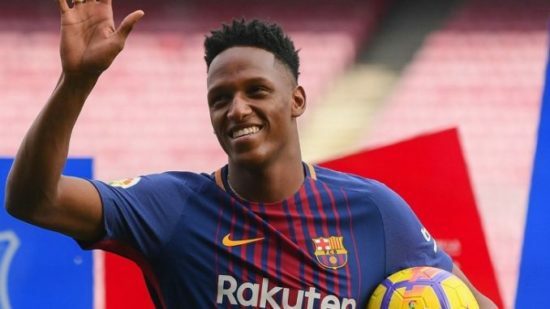 As the transfer window closes soon, the England giants Manchester United mean business as they are trying to bring Barcelona’s Yerry Mina over to Old Trafford. In a report by The Sun, United are said to be offering £35million to Barca in a bid to sign the 23-year old defender. Recently, Manchester United were linked to a transfer deal with Leicester City’s Harry Maguire but it doesn’t appear to work out as United couldn’t meet up with the asking price of Toby Alderweireld, hence, making the Red Devils switch course to Barcelona. The Columbian joined Barca in January 2018 and can be referred to as a versatile and skillful player despite his playing position, he still utilizes any means possible to net a goal as he was recently awarded in the 2018 FIFA World Cup for the most goals scored in a single World Cup by a defender after he scored three goals in the tournament. Meanwhile, Mina’s chance of featuring as a starter in Barcelona has been dampened, following the recent signing of Clement Lenglet to the club, as It is very much likely the French footballer be the first choice of head coach Ernesto Valverde. However, it is expected that Mina gets signed to United as he has a better chance to explore in the English side and especially as the Red Devils appears to be close to sealing the deal.